Welcome to High Valley Country Club development. This is one of the nicest homes in the area. Built in 2007 by Randlewoods this 2 bed, 1 full bath home with private guest house sits on over a 1/4 acre lot. Features include a propane fireplace embraced with stones and wooden mantle, rich tones throughout. An open floor plan allows everyone to stay connected, even the cook. An alley style kitchen boasts ample custom cabinetry, counter space, a gorgeous breakfast bar plus a walk in pantry. 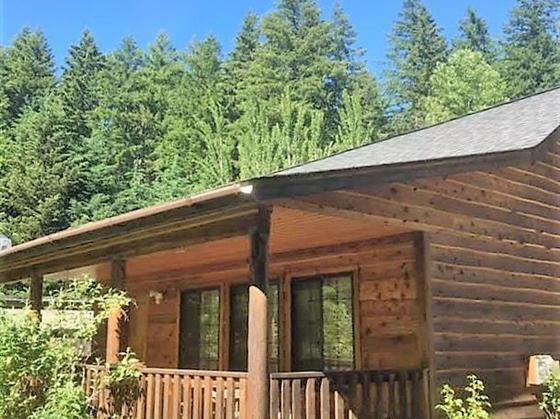 The private guest quarters occupy the rear half of the detached garage,complete with a full bath (jetted tub), wood stove, closet and separate cooking area.The front 1/2 of garage is a single stall over-sized parking area and cooking space for guests. A fully fenced back yard scattered with fruit trees, a fenced flower garden and large deck. High Valley Country club offers members a golf course, swimming pool,play area and community hall.